This work was a finalist in the 1938 Wynne Prize and was acquired by the Gallery in 1938. Signed and dated l.r., pen and black ink "HANS HEYSEN. 1936". 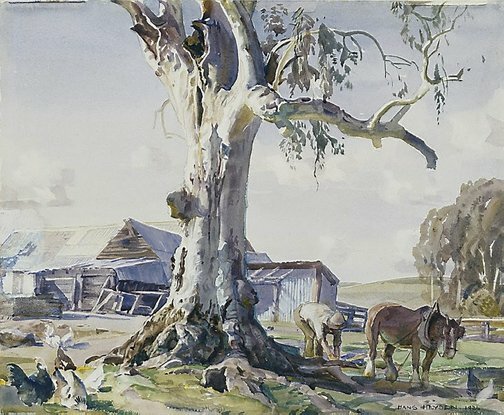 Hans Heysen , 'Heroic gum trees', pg. 52-59, Adelaide, 2008, 54 (colour illus. ), 136 (colour illus.). Barry Pearce, Australian art: in the Art Gallery of New South Wales , 'Earth, sky and paint', pg. 149-150, Sydney, 2000, 154 (colour illus. ), 300.